It’s Spring Break! 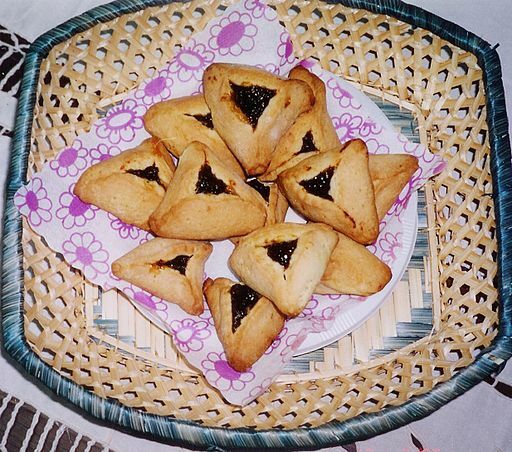 And Happy Purim! 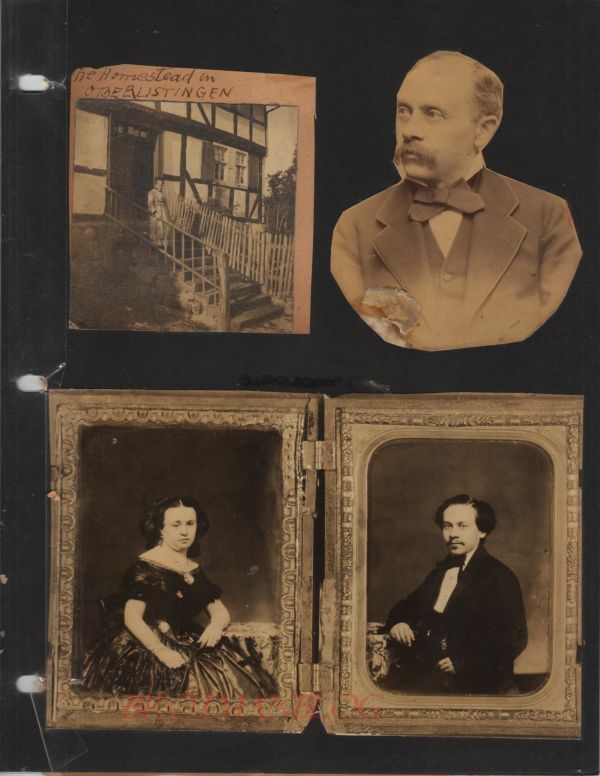 This is Part V of an ongoing series of posts based on the family album of Milton Goldsmith, so generously shared with me by his granddaughter Sue. See Part I, Part II, Part III and Part IV at the links. 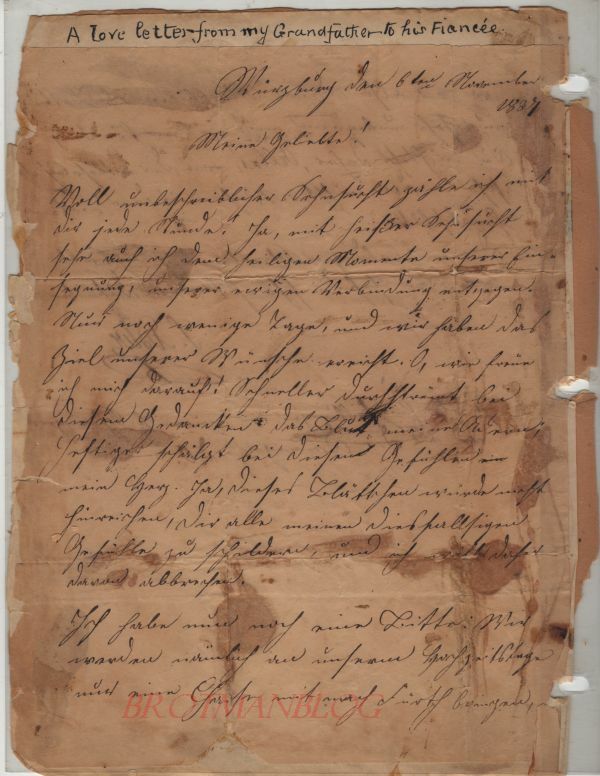 As promised, today I am sharing a letter that Samuel Adler wrote to his beloved fiancée, Sarah Kargau, shortly before their marriage in 1837. The letter must have continued on the back of the page, as Sue could see there was writing on the reverse side. 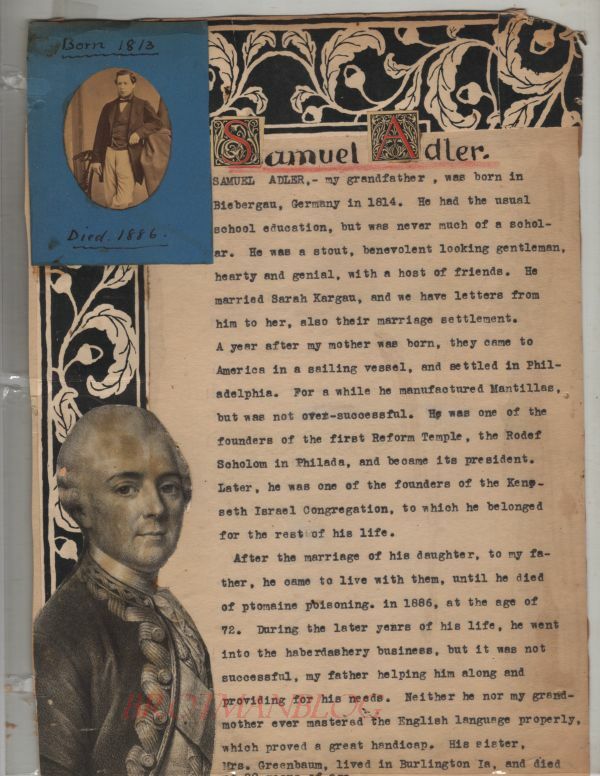 But she did not want to risk damaging this 182-year-old letter by trying to remove it from the album, so we don’t know how Samuel closed out the letter. What a passionate letter! 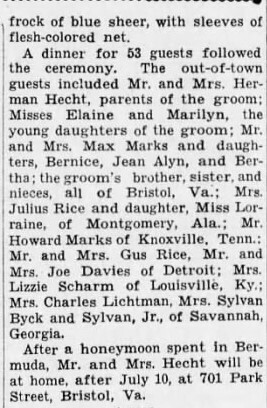 This was no marriage of convenience arranged by parents or a matchmaker. This was a true affair of the heart. I admit to being surprised by the ardor expressed so openly in this letter—the desire is palpable. Samuel was certainly a man in love (or at least in lust). But what was the vase or chaise reference all about? I guess some things are best left to the imagination. In so many ways, Rebecca Goldsmith seemed to be living a charmed life up through the 1920s. 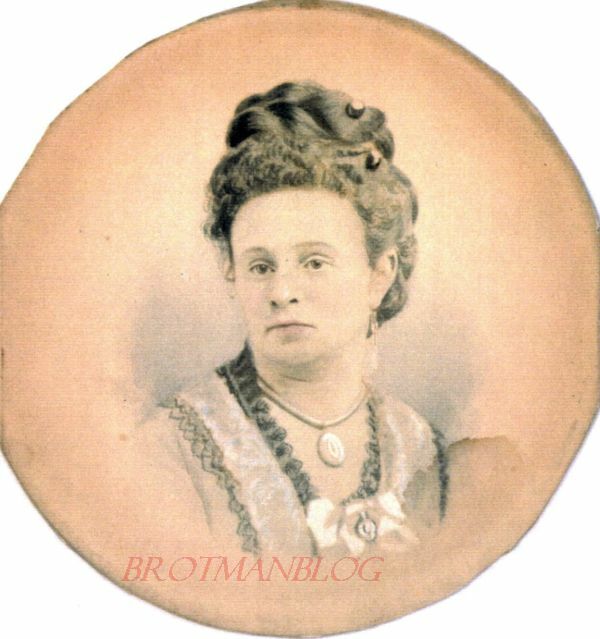 She had married a successful doctor, Robert Levy, had two daughters, Leona and Marion, and was able to provide a home in Denver for many years for a number of her sisters and her father Jacob. She seemed to be a generous and loving sister and daughter. She’d hosted weddings for three of her sisters—Eva, Florence, and Gertrude. 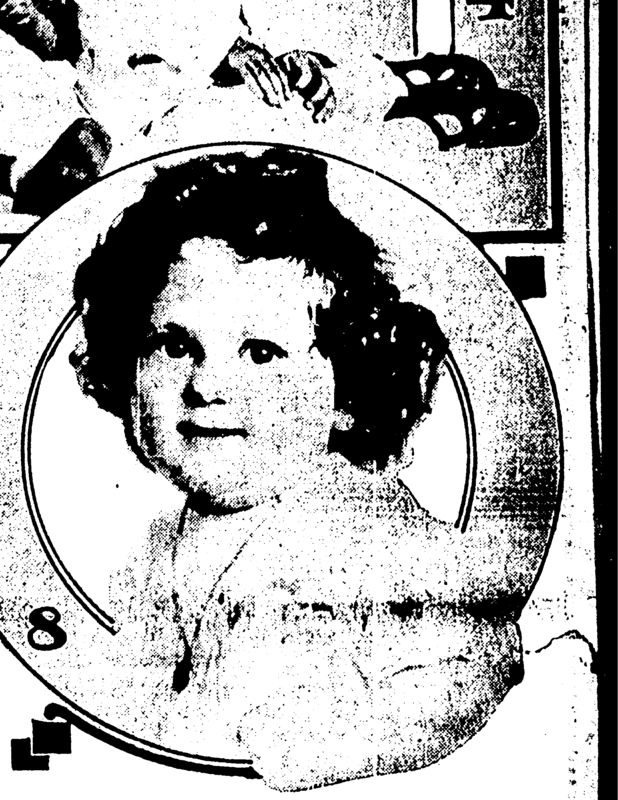 In 1914 her older daughter Leona had married a doctor—Stanley Eichberg—and in 1915, Rebecca and her husband Robert Levy were blessed with a granddaughter, Betty. 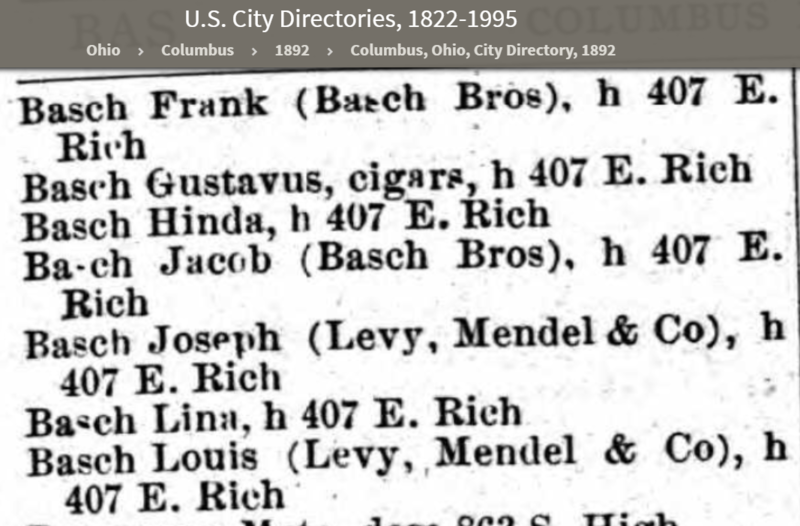 And on January 16, 1920, a second grandchild was born, Robert Levy Eichberg, named in honor of his grandfather. As Rebecca neared her 50th birthday, she must have been filled with gratitude for her wonderful life. Leona was a 29-year-old widow with a five-year-old daughter and a one-year-old son. She must have been devastated. But more tragedy was yet to come. 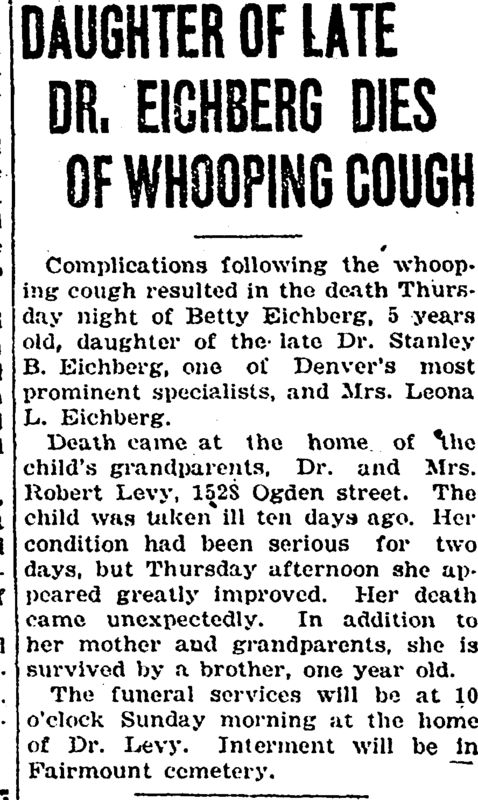 Just five weeks later, Leona’s daughter Betty, just five years old, died due to complications from the whooping cough. Leona had lost both her husband and her young daughter within weeks of each other. 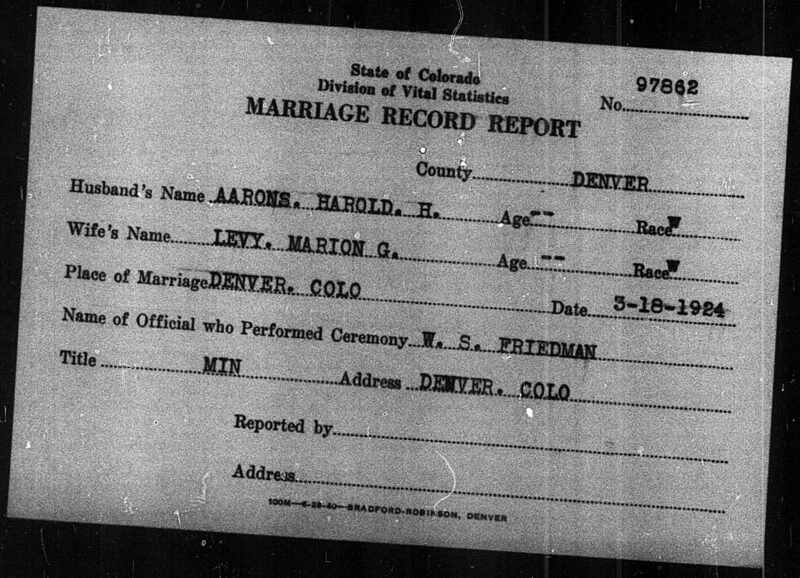 Exactly one year later, Marion was burying her husband Harold. 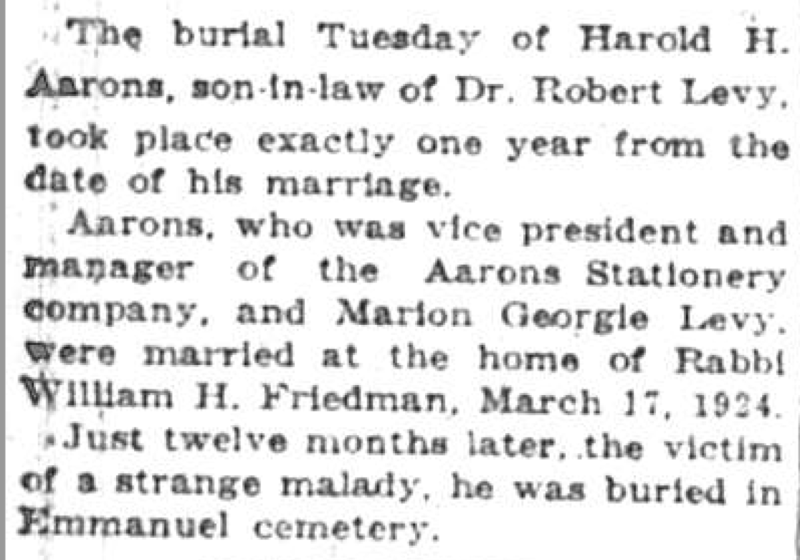 According to his obituary, the 27-year-old died from a “strange malady” on March 17, 1925. 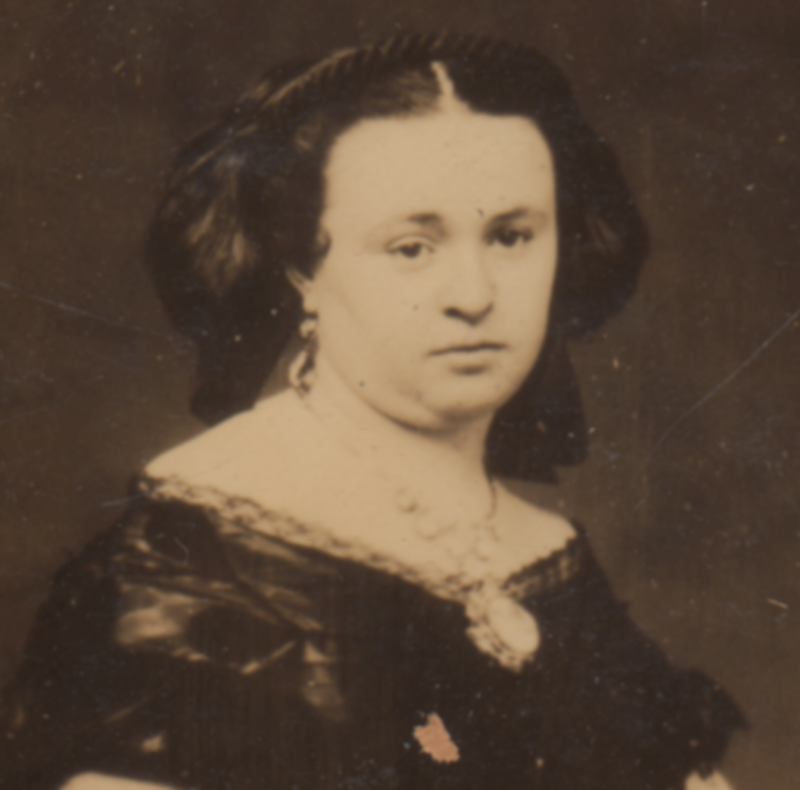 Rebecca Goldsmith Levy now had two widowed daughters. 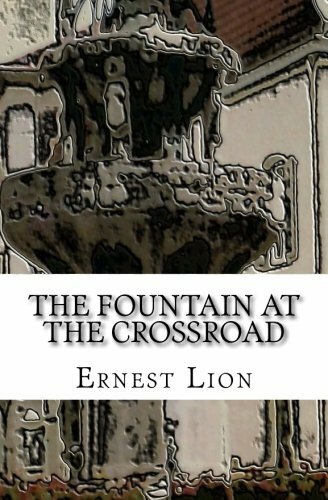 Her blessed life had become unraveled. In 1930, both of these two young widows, Marion and Leona, were living with their parents as was Leona’s son, Robert Levy Eichberg, just ten years old. This all seems to have broken Rebecca’s spirit as well as her heart. 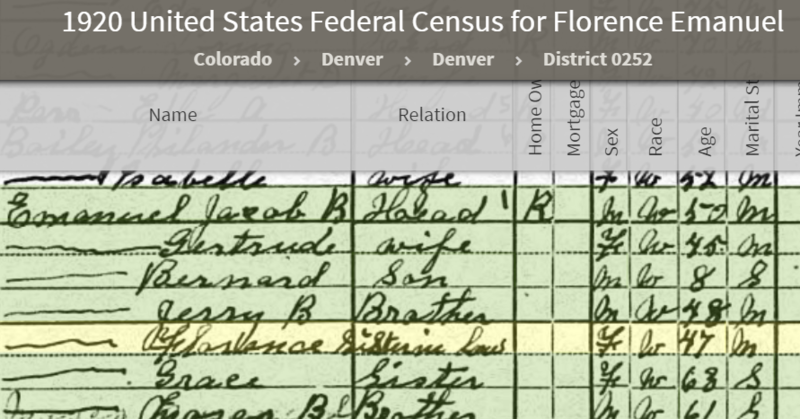 According to the 1940 US census, by 1935, Rebecca was a patient at the Colorado Springs Psychopathic Hospital in Colorado Springs, and she was still residing there when the 1940 census was enumerated. 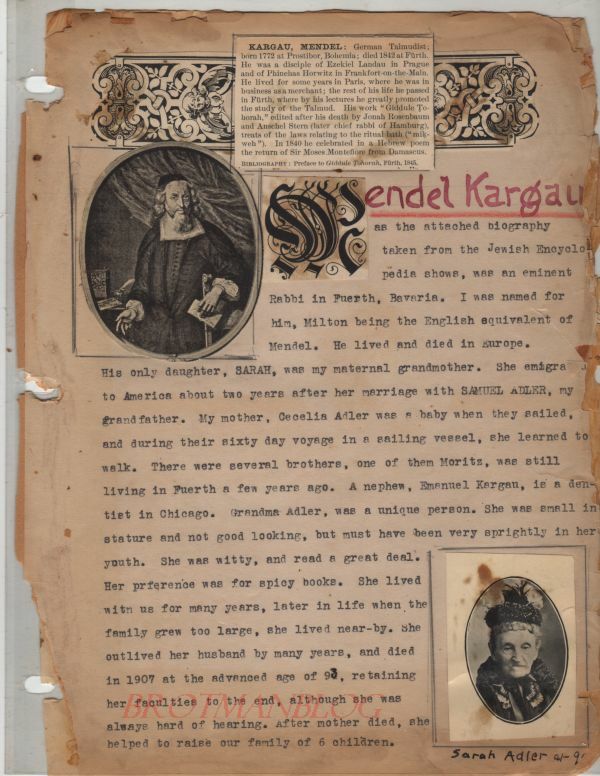 She died not long afterwards on November 8, 1940, at the age of 74.3 I could not find any obituary or death notice or death certificate for Rebecca, only the burial record on the JewishGen Online Worldwide Burial Registry and FindAGrave. 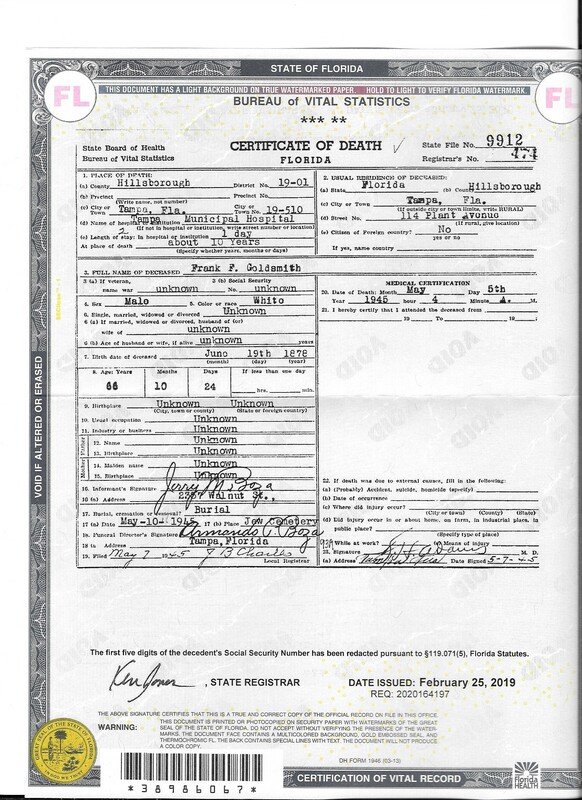 UPDATE: After much effort, I was able to obtain a copy of Rebecca’s death certificate. 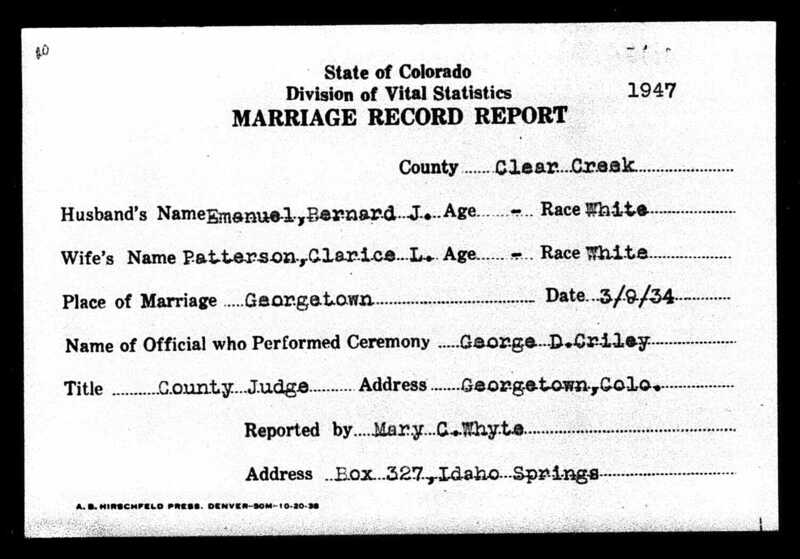 From the information on the death certificate, I now can calculate that she entered the Colorado Springs Psychopathic Hospital on August 15, 1936, four years, two months, and 24 days before her death. She had been under the same doctor’s care since March 26, 1935, and had suffered from arteriosclerosis for 20 years and diabetes for five years. Her ultimate cause of death was a cerebral hemorrhage. 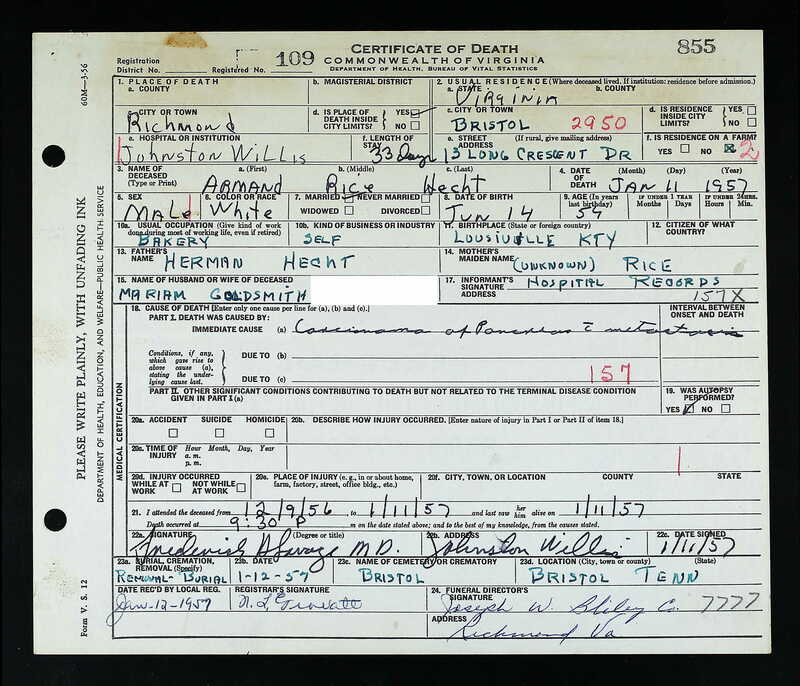 Her husband Robert was the informant on her death certificate. 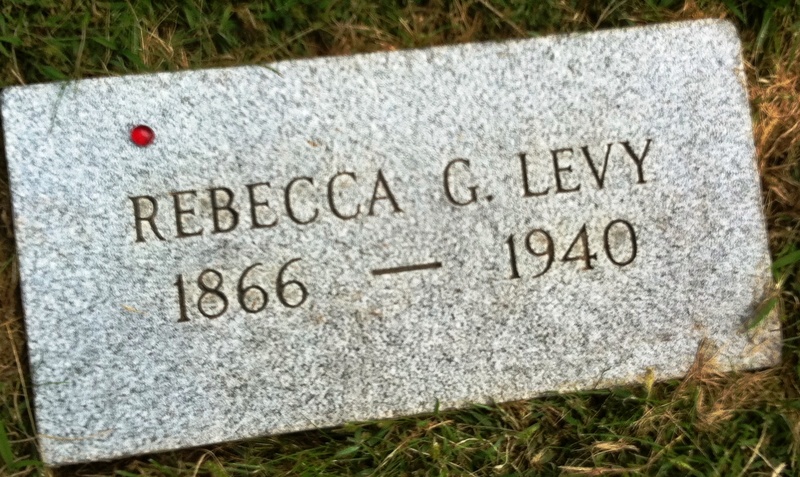 Find A Grave, database and images (https://www.findagrave.com : accessed 05 March 2019), memorial page for Rebecca G Levy (1866–1940), Find A Grave Memorial no. 50939404, citing Fairmount Cemetery, Denver, Denver County, Colorado, USA ; Maintained by Athanatos (contributor 46907585) . 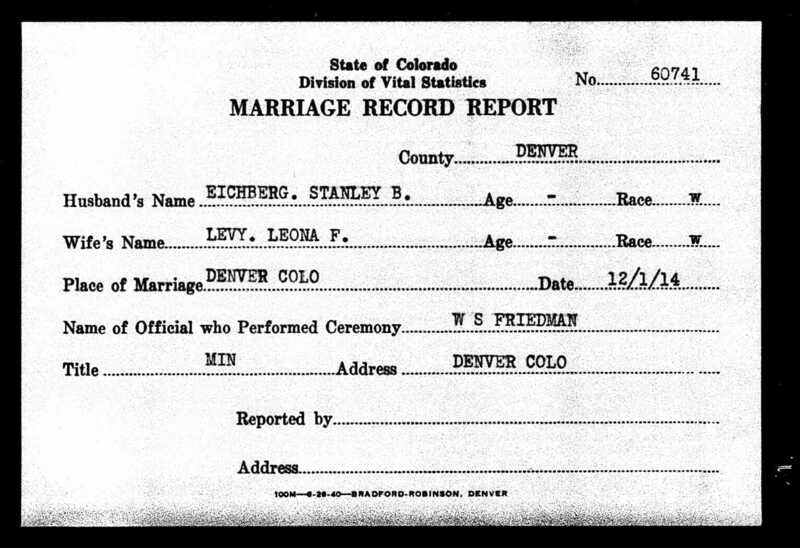 In 1940, Robert Levy, Rebecca’s widower, was living with his other daughter, Leona Levy Eichberg, and his grandson Robert in Denver, where Robert (the elder), now 76, continued to practice medicine.8 In fact, it seems that Robert continued to practice up until his death at 81 on July 1, 1945. 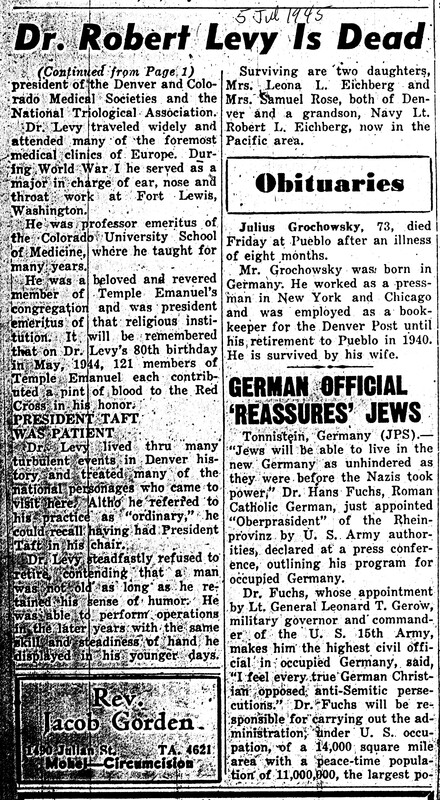 He received a wonderful obituary in the Intermountain Jewish News on July 5, 1945, pp.1, 14. 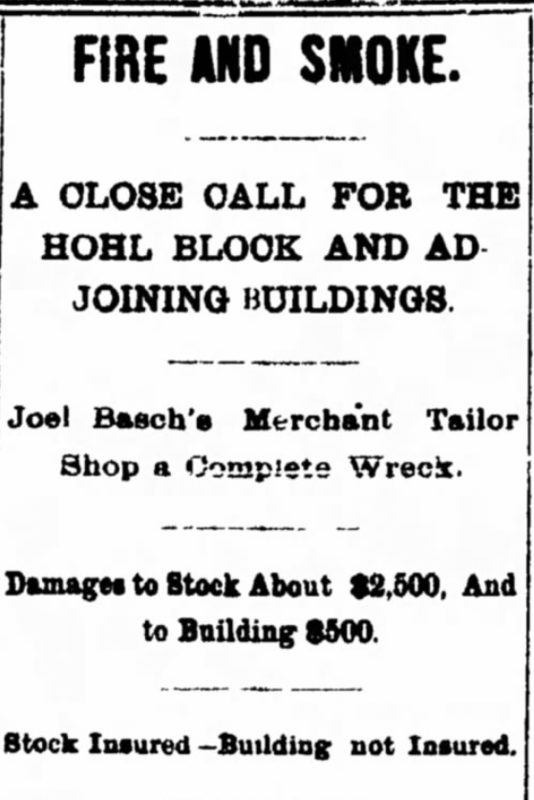 Knowing that Rebecca Goldsmith and Robert Levy’s daughter Marion lived to 95 and that their daughter Leona and grandson Robert Eichberg have numerous living descendants took some of the edge off the tragedy that this family endured in the 1920s. But even so, it is still a heartbreaking and unfair chapter in the life of Rebecca Goldsmith. This is Part IV of an ongoing series of posts based on the family album of Milton Goldsmith, so generously shared with me by his granddaughter Sue. See Part I, Part II, and Part III at the links. 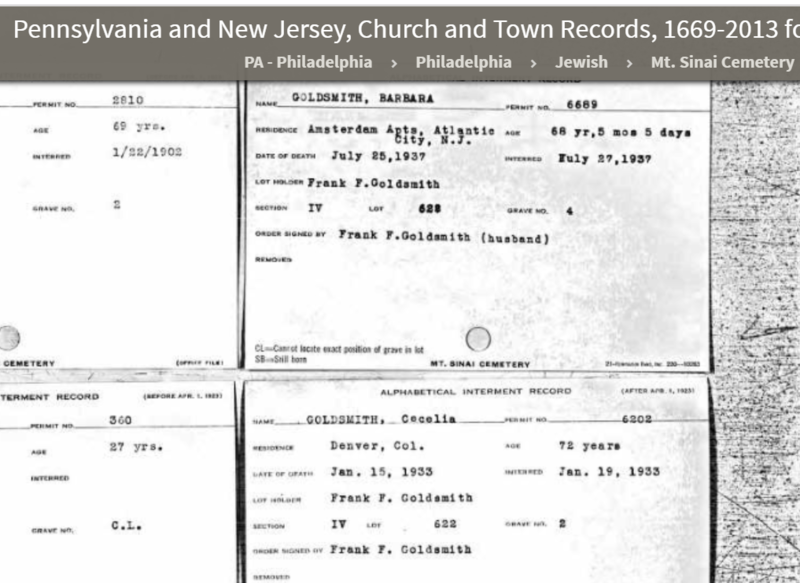 In addition to the biographies of his father Abraham and paternal grandfather Seligmann Goldschmidt, Milton Goldsmith wrote about his mother’s family. His mother was Cecelia Adler, Abraham’s first wife, and she was the daughter of Samuel Adler and Sarah Kargau. 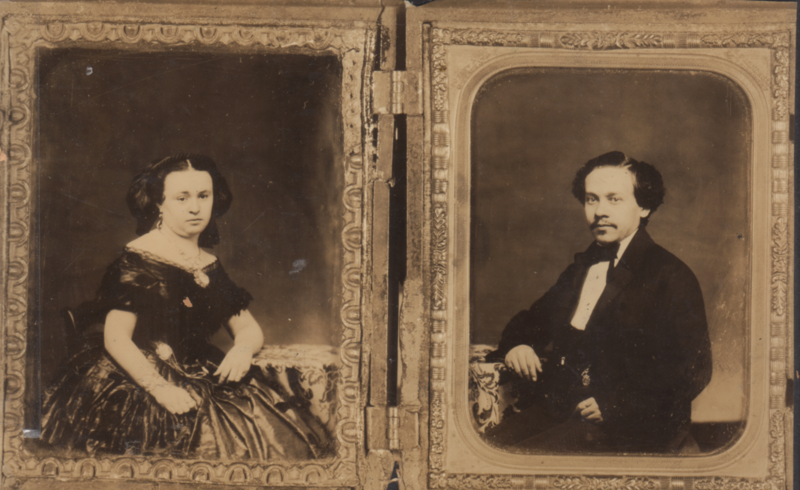 Although Cecelia’s family is only related to mine through her marriage to Abraham, it is nevertheless fascinating to read about her parents. 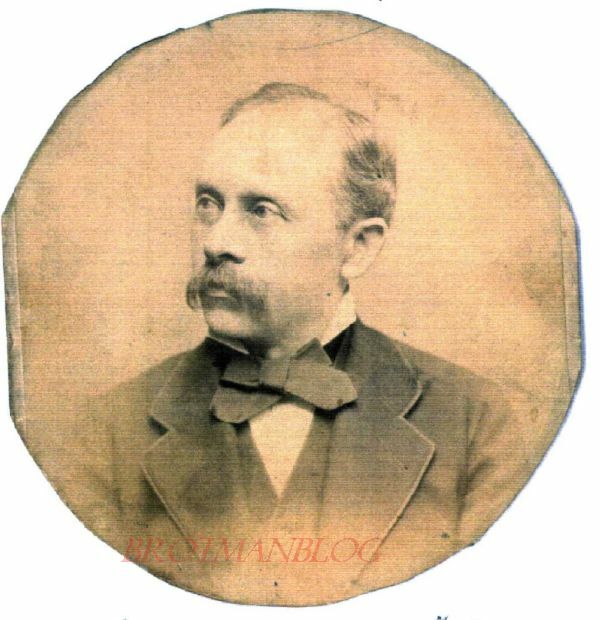 Samuel Adler,–my grandfather, was born in Biebergau, Germany in 1814. He had the usual school education, but was never much of a scholar. He was a stout, benevolent looking gentleman, hearty and genial, with a host of friends. He married Sarah Kargau, and we have letters from him to her, also their marriage settlement. 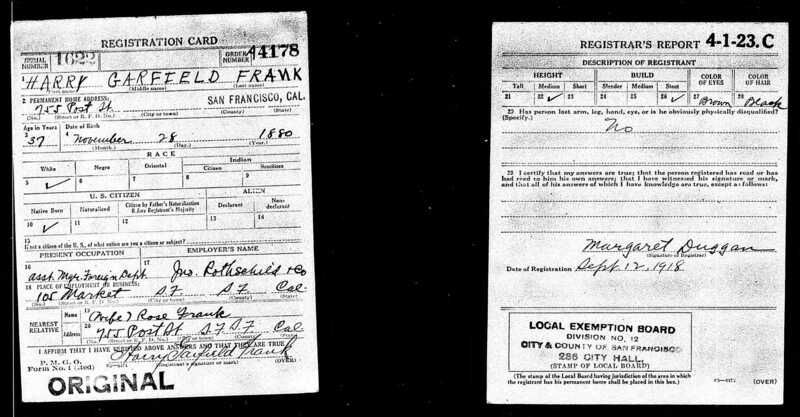 A year after my mother was born, they came to American in a sailing vessel, and settled in Philadelphia. For a while he manufactured Mantillas, but was not over-successful. 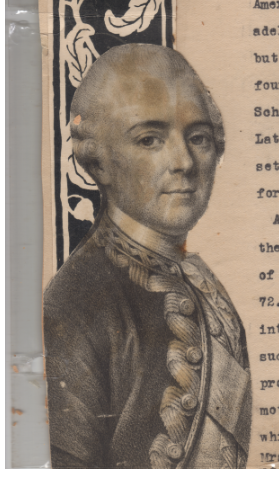 He was one of the founders of the first Reform Temple, the Rodef Scholom in Philada, and became its president. 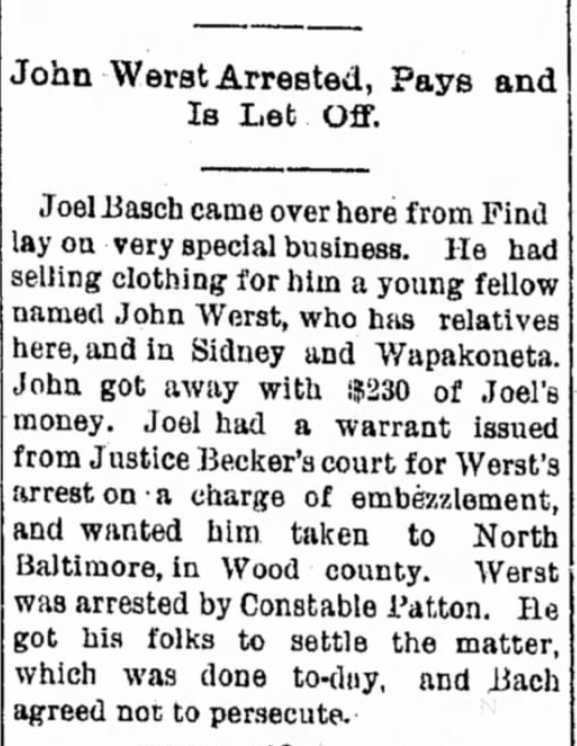 Later, he was one of the founders of the Keneseth Israel Congregation, to which he belonged for the rest of his life. After the marriage of his daughter, to my father, he came to live with them, until he died of ptomaine poisoning in 1886 at the age of 72. 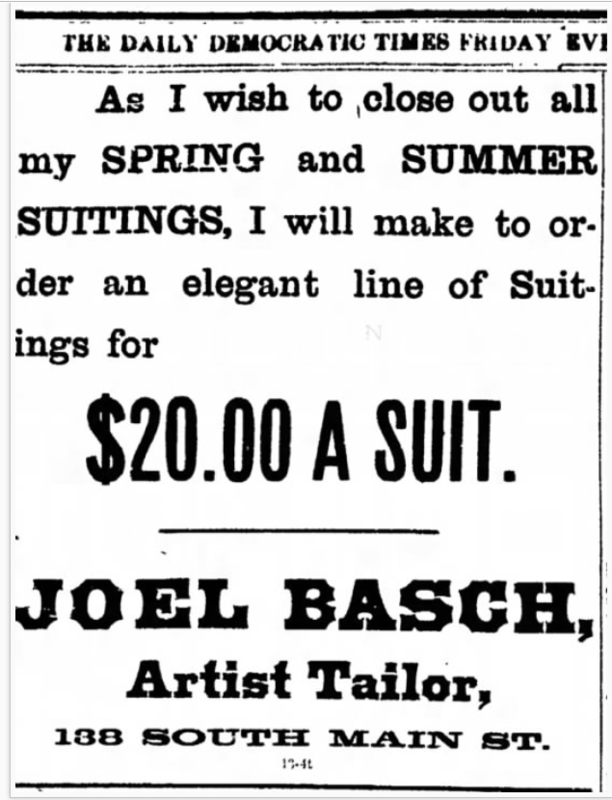 During the later years of his life, he went into the haberdashery business, but it was not successful, my father helping him along and providing for his needs. Neither he nor my grandmother ever mastered the English language properly, which proved a great handicap. 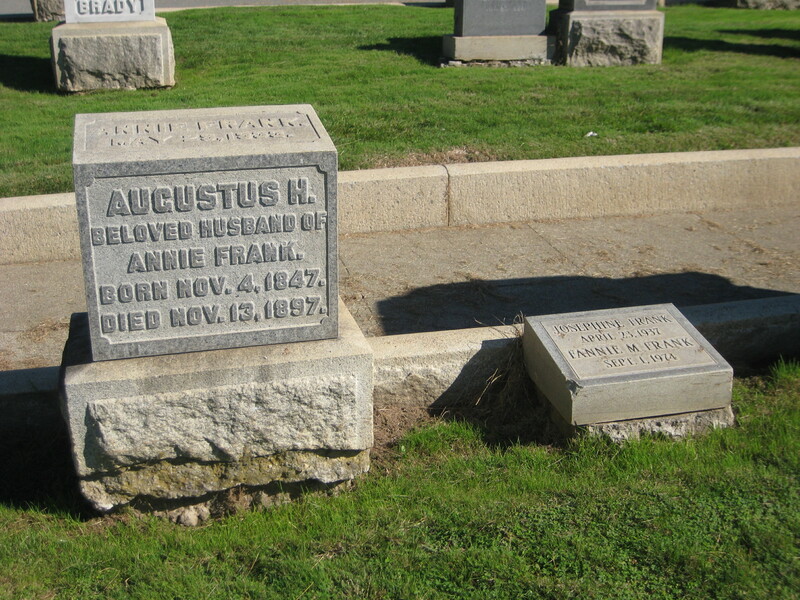 His sister, Mrs. Greenbaum, lived in Burlington, Ia. and died at 90 years of age. I was left with the impression that Samuel was a wonderful man and well-loved by his family and his community, but not much of a businessman. Certainly he did not measure up to Abraham’s success in business in Milton’s eyes, but this is nevertheless a very loving tribute to his grandfather. 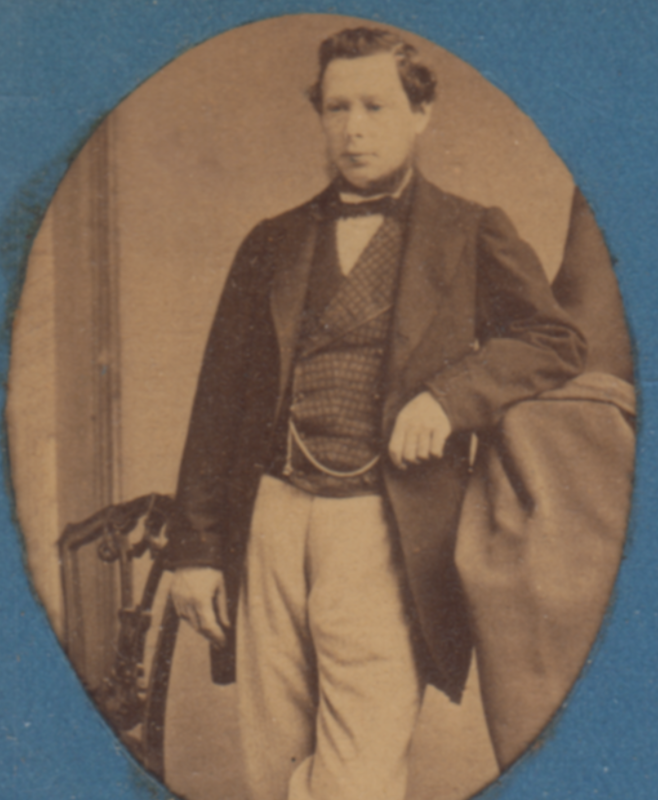 Milton also included this photograph of his grandfather Samuel. But is the man depicted on the lower left side of the page supposed to be Samuel looking like a young George Washington? Or someone else? Any ideas? 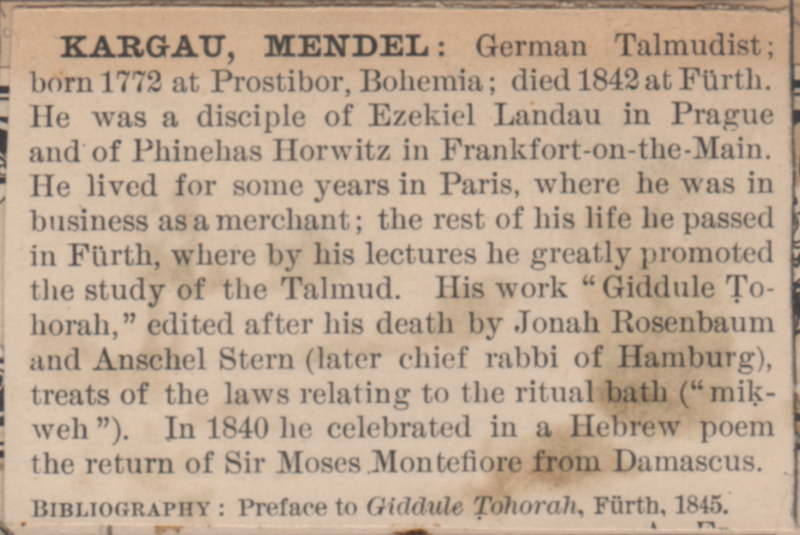 Mendel Kargau, as the attached biography taken from the Jewish Encyclopedia shows, was an eminent Rabbi in Fuerth, Bavaria. I was named for him, Milton being the English equivalent of Mendel. He lived and died in Europe. 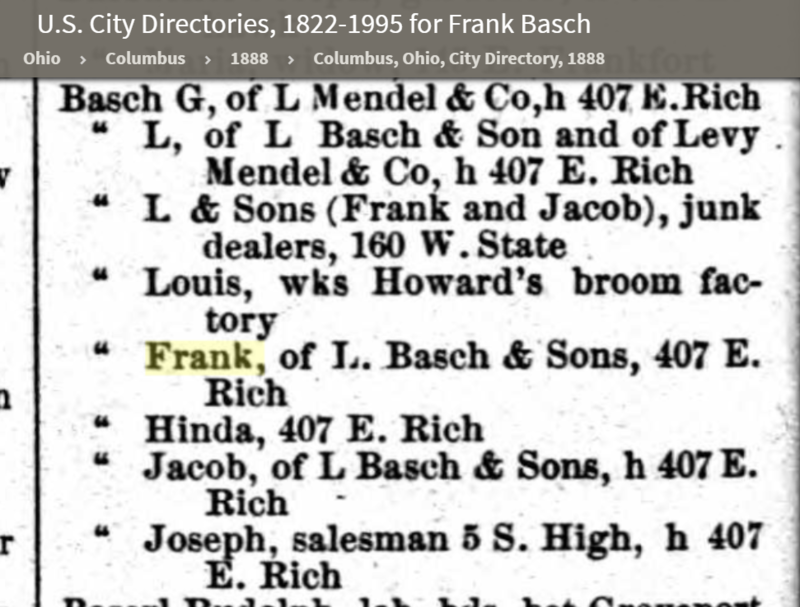 His only daughter, SARAH, was my maternal grandmother. 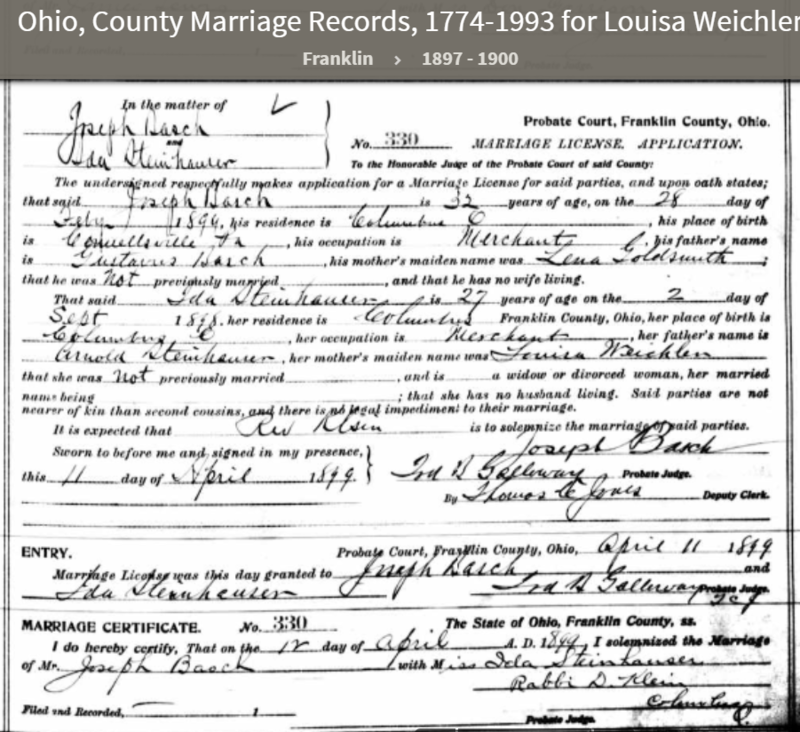 She emigrated to America about two years after her marriage with SAMUEL ADLER, my grandfather. My mother, Cecelia Adler was a baby when they sailed, and during their sixty day voyage in a sailing vessel, she learned to walk. There were several brothers, one of them Moritz, was still living in Fuerth a few years ago. A nephew, Emanuel Kargau, is a dentist in Chicago. Grandma Adler, was a unique person. She was small in stature and not good looking, but must have been very sprightly in her youth. She was witty, and read a great deal. Her preference was for spicy books. 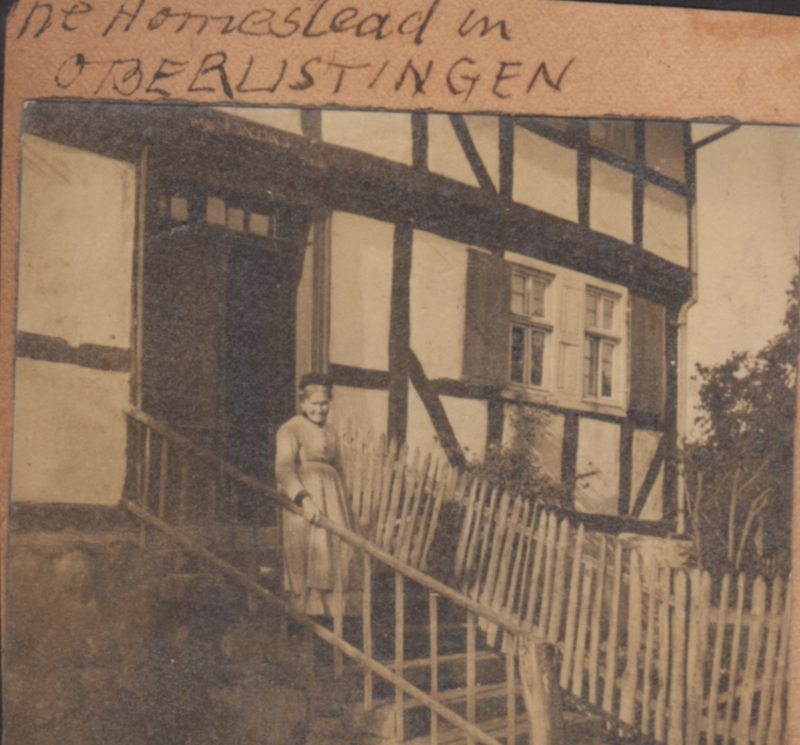 She lived with us for many years, later in life when the family grew too large, she lived near-by. 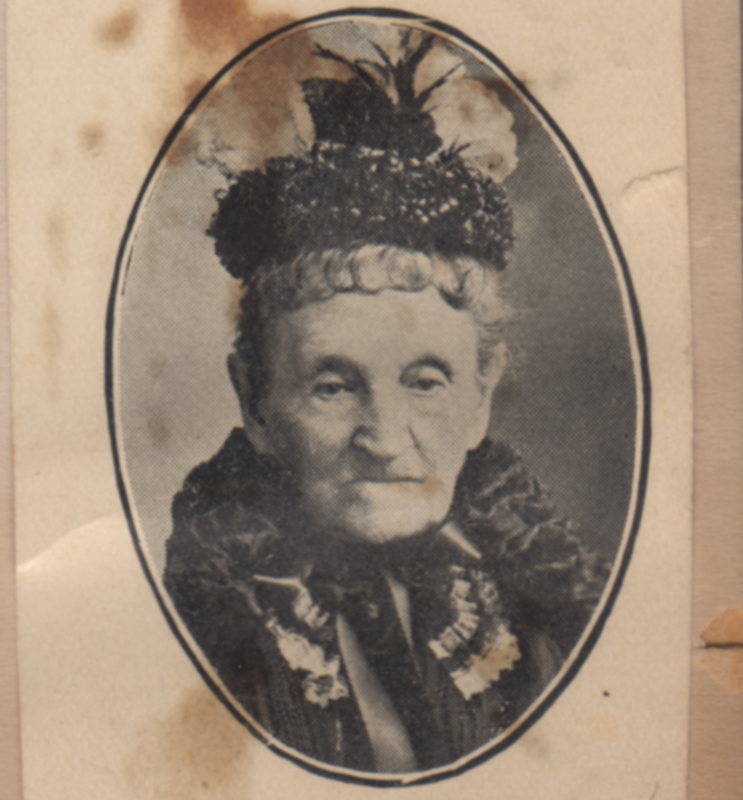 She outlived her husband by many years, died in 1907 at advanced age of 93, retaining her faculties to the end, although she was always hard of hearing. After mother died, she helped to raise our family of 6 children. When I researched Milton’s family, I noted that after his mother Cecelia died, his maternal grandparents Samuel and Sarah Adler lived with the family, and I’d assumed that Sarah had taken on part of the responsibility of caring for her daughter’s motherless children. 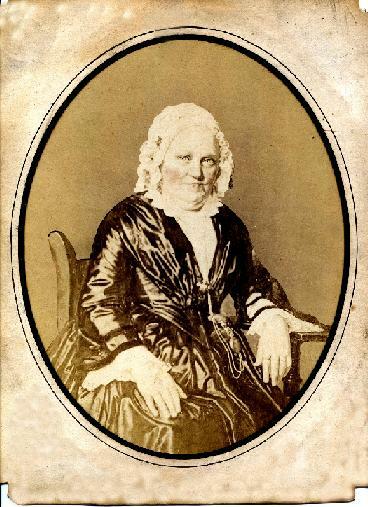 Milton’s essay confirmed that assumption and painted a picture of a grandmother who was lively, interesting, and, his words, unique. I found it amusing that he said she wasn’t good looking. Maybe at 93 she wasn’t or even in her fifties when Milton was a child. Like most children, he probably just saw his grandma as an old lady. I love this photograph of his grandmother. I have zoomed in on it here so that we can see Sarah Kargau Adler more clearly. I bet she was attractive as a young woman when she swept Samuel Adler off his feet. The letter he wrote before their wedding certainly reveals a man deeply in love. I will save that for my next post. 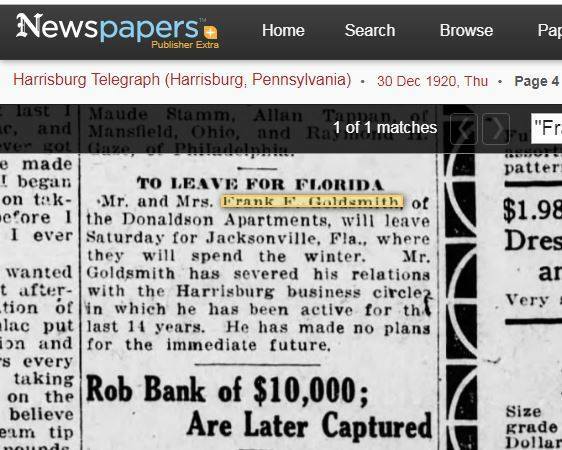 In January 1921, only seven of Jacob Goldsmith’s fourteen children were still living: Annie, Celia, Frank, Rebecca, Florence, Gertrude, and Eva. 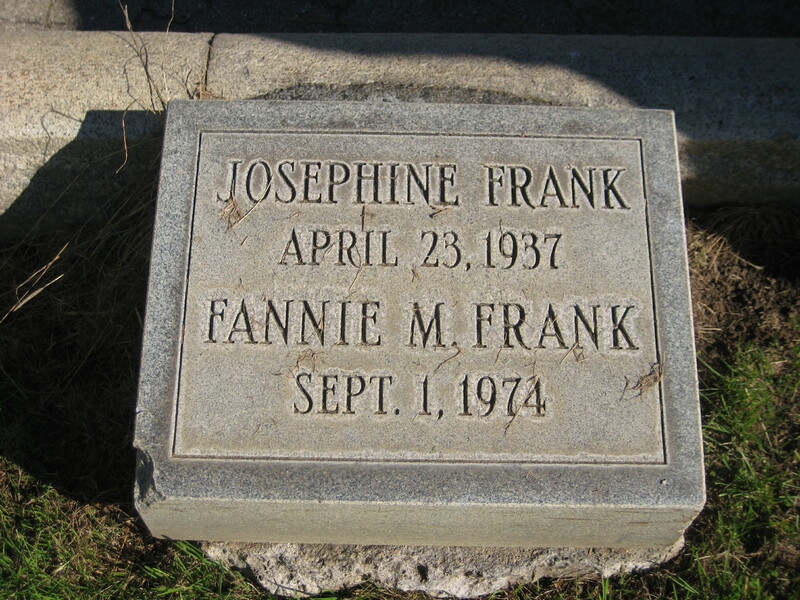 For Annie, Celia, Frank, and Florence, the 1920s were relatively quiet. But this decade did bring loss and heartbreak, especially for three of the sisters, Eva, Gertrude, and Rebecca. 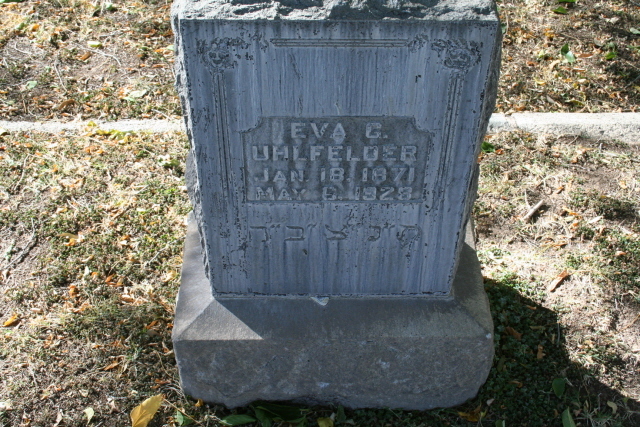 The family lost another sibling on May 6, 1928, when Eva Goldsmith Uhlfelder died in Albuquerque, New Mexico. 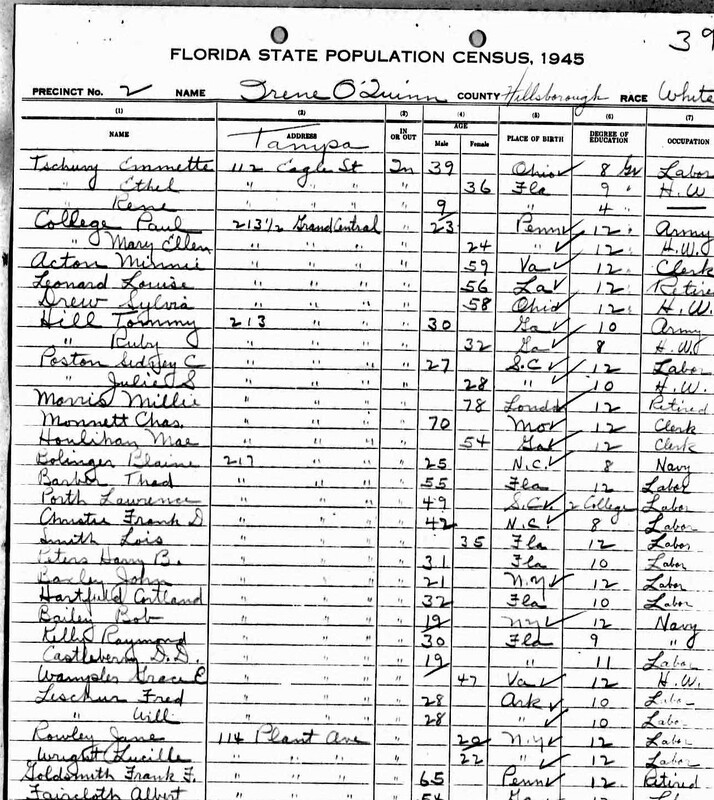 By 1940, Sidney was married to Katherine Bowers.3 Katherine was born on August 9, 1905, in Springfield, Missouri, to Jacob Bowers and Sallie Bryson.4 She’d lived in Missouri as recently as 1935, according to the 1940 census, so I am curious as to how she and Sidney met. 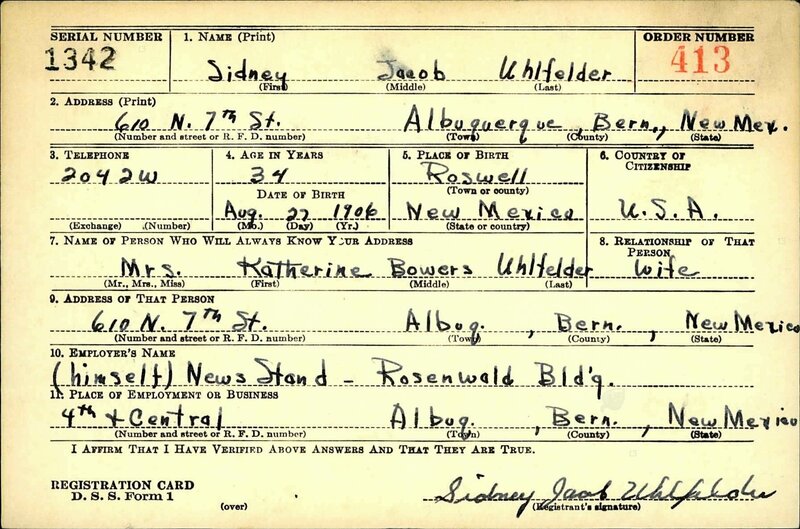 In 1940, Sidney and Katherine and Katherine’s mother were living together in Albuquerque. 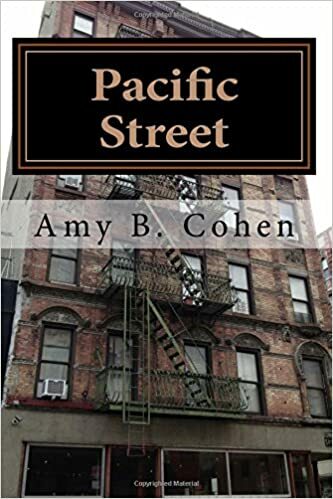 Katherine was working as a saleswoman in an “Indian curio store,” and Sidney reported that he was the proprietor of a cigar store. 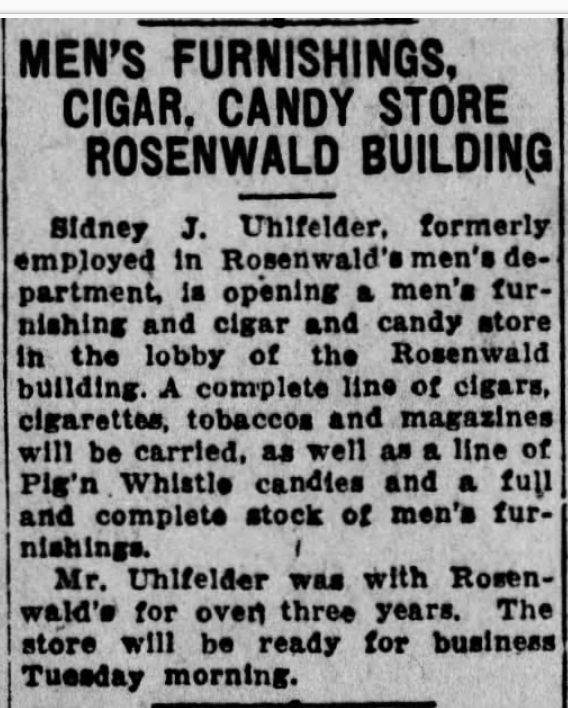 On his World War II draft registration, Sidney reported that he was the owner of a newstand in the Rosenwald Building in Albuquerque. Sidney and Katherine both lived long lives together in Albuquerque; she died at 91 on June 7, 1997,5 and Sidney lived to 97, dying on February 14, 2004, in Albuquerque.6 According to his obituary, he was a “loving and caring man.”7 There were no children listed as survivors in the obituary. 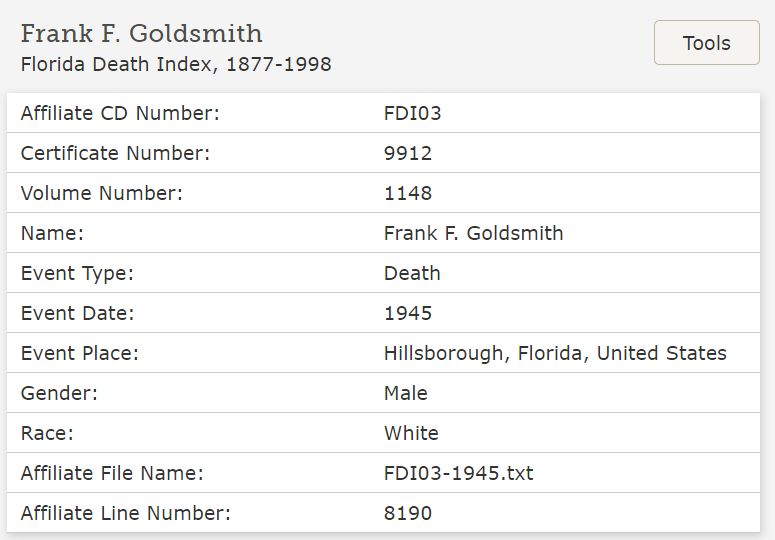 Eva Goldsmith Uhlfelder thus has no living descendants. The loss of Eva in 1928 brought the count of the surviving children of Jacob Goldsmith down to six, and the rest would survive the 1920s. 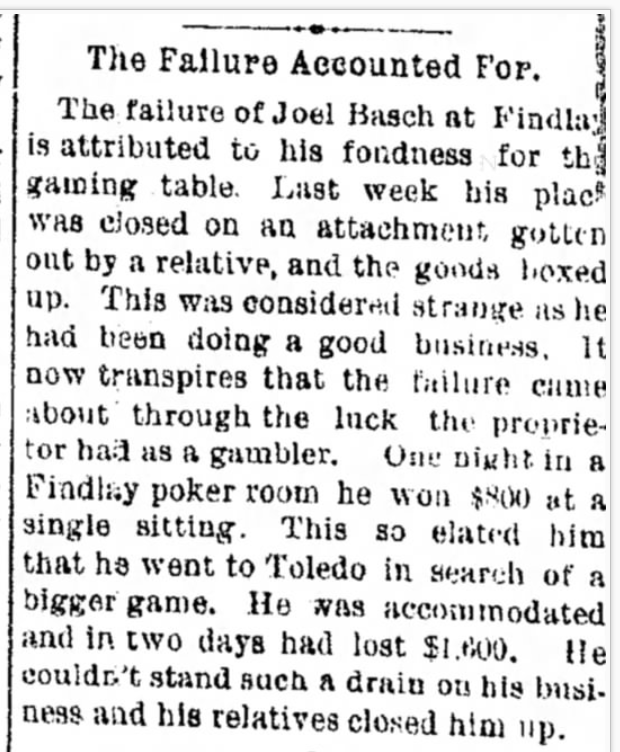 But there were other losses suffered by the extended family. His son Bernard was only ten years old when his father died. 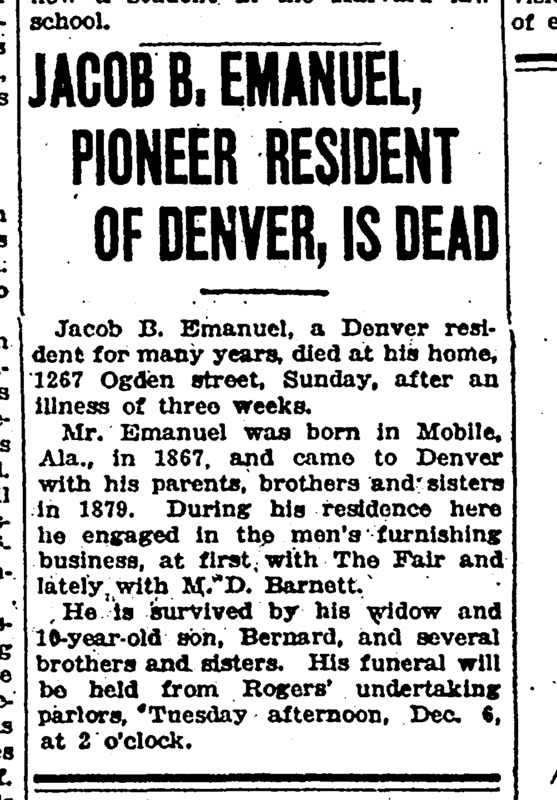 Nine years later, however, in 1930, Bernard was not living with his mother, but with his aunt Florence Goldsmith Emanuel (his mother Gertrude’s older sister) and uncle Jerry Emanuel (his father Jacob’s brother) as well as his aunt Celia Goldsmith, another of his mother’s sisters. Gertrude Goldsmith Emanuel died on June 21, 1937, in Denver; she was 66 years old.11 Her son Bernard died on October 22, 1973, in Denver; he was 62.12 I was unable to find any other information about Bernard’s wife Clarice, and as far as I can tell, Bernard and Clarice did not have children. Gertrude, like her sister Eva, thus does not appear to have any living descendants. 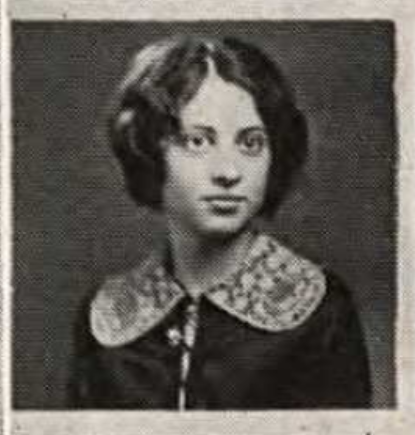 The sibling who suffered the most losses in the 1920s was Rebecca Goldsmith Levy. Her story merits a separate post.